The 1994 conviction of three teenagers accused of murdering three young boys in West Memphis was finally overturned in 2011, following years of public pressure. 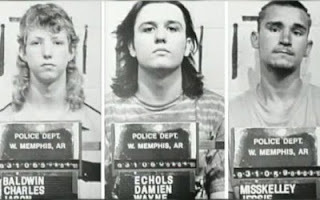 The case of the West Memphis Three has been covered extensively across almost two decades but Amy Berg's 'West Of Memphis' documentary is perhaps the most comprehensive portrait yet. Amy Berg (Academy Award nominated director of 'Deliver Us From Evil') was approached by Peter Jackson and his wife Fran Walsh in 2009 to discuss the cases of Damien Echols, Jesse Misskelley Jr, and Jason Baldwin - West Memphis Three. Soon after, Berg met Lorri Davis, the wife of Echols, becoming so convinced of the failure of the judicial system that 'West Of Memphis' was born. 'West Of Memphis' covers the case from the initial news stories surrounding the 1993 Arkansas murders of three eight year old boys to the eventual release of the West Memphis Three. Echols, Misskelley Jr and Baldwin were convicted of the murders, said to have been committed in ritualistic fashion, thanks largely to their outsider "satanic" status and Misskelley's (co-erced) confession to the police. Archive footage and talking heads build up an exhaustive understanding of the case, as well as the trio themselves - in particular, Echols (one of the film's producers) and his wife Davis. As the documentary progresses, the staggering negligence, misconduct and incompetence of the local police and legal departments becomes increasingly apparent. Feelings of frustration, sadness, and even anger boil over from the screen to within the viewer. The film reflects on the reach of the case - the sense of injustice not only affecting celebrities (the likes of Henry Rollins, Johnny Depp, Patti Smith, and Eddie Vedder all appear) to members of the victims' families. Peter Jackson plays a prominent role (both on-screen, and off), as does his wife, Fran Walsh - the duo's tireless support undoubtedly has contributed to the release of The West Memphis Three. The quest for truth and justice still continues, although 'West Of Memphis' points an accusing finger in a very specific direction. While convincing evidence is presented to support this conclusion, the manipulative gesture is somewhat reminiscent of the manner in which The West Memphis Three were originally ostracised. 'West Of Memphis' explores a well trodden path but is impressively crafted. The running time extends to well over two hours, comprehensively examining the miscarriage of justice, aided by an emotive score from Nick Cave and Warren Ellis. The film's final dedication is perhaps its most moving moment, telling viewers - "You made a difference. You made all the difference." 'West Of Memphis' screened at the 56th BFI London Film Festival in 2012. UK release to be confirmed..